The most powerful natural force of our civilization from the dark ages to the present is “Fire”. Fire to drive our machines, fire to warm our bodies, fire to cook our food, fire to produce the goods of our economy. Fire has been and is a tremendous friend of man but it can also be an awesome enemy as demonstrated over and over through the history of human kind as we know it. The early Greeks and Romans saw the need to establish and maintain fire control forces made up of machines and most importantly people. M. Lorenze, Thomas P. McDonagh, and Thomas B. R. Mudd. This commission’s efforts, along with the fine example of the Leonardtown Volunteers a year earlier, the efforts and interest of the La Plata Founding Volunteer Members, and the support of all the men and ladies of La Plata were responsible for founding the La Plata Volunteer Fire Department. 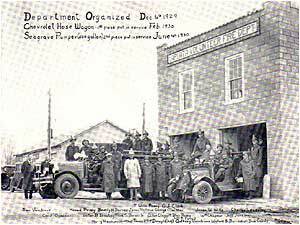 At the first formal meeting of the La Plata Volunteer Fire Department, Inc. held at the Court House in La Plata a truly great step was made on Friday, December 6, 1929. Thirtyfour La Plata residents committed themselves to the task of providing the force necessary to control Charles County’s awesome enemy, “Fire.” Shortly thereafter a committee made of H. Maxwell Mitchell, Thomas P. McDonagh, and Ralph M. Lorenze tackled the task of providing modern automotive equipment to replace the hose cart, buckets, and small ladders that made up the then present equipment of the Fire Department. The “fire fighting squad” as the then active members were called before their formal training and set about the task of protecting life and property as best they could under very difficult circumstances. ton, Mrs. Edith Bird, Mrs. Beverly Barnes, Miss Mattee Owen, Miss Elizabeth Barnes, and Mrs. Evelyn Bowling secured permission for the use of the High School building for the purpose of a Firemen’s Ball to raise money for the Department. This Firemen’s Ball soon evolved into an annual affair. As the equipment and machines of the Fire Department were placed in service it quickly became evident that it would take more money and support than was available from the citizens and businessmen of La Plata. A committee of Leo K. Farrall, Sr., Harry Hawkins, Wallace Barnes, Hugh Mitchell, and Thomas P. McDonagh was formed to hold the Firemen’s Carnaval which was to become the major source of funds for many years. The first Carnaval was held on the lot where the present Rescue Squad building stands. All manner of activiites were held, such as prize fights, greased pole climbing, parachute jumps from a hot air ballon floating 4,000 feet in the air. 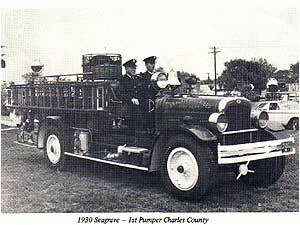 The “seagrave” with siren sounding was used to retrieve the parachutes after he floated to earth a mile or more from town, depending which way the wind was blowing. By May of 1930 the Department was able to provide service outside the Town limits after receiving delivery of its second engine, a 500 G.P.M. Seagrave with a 100 gallon water tank and full complement of hose and equipment. The La Plata Volunteer Fire Department has operated in this manner ever since, providing in town and out of town fire protection with apparatus designed for specific service. In June of 1930 the Department joined the Maryland State Firemen’s Association and traveled to their Baltimore Convention to exhibit the Seagrave pumper. In preparation of the event the first can of auto polish was purchased from Mitchell Motor Company for $0.75. One of many cans of polish for parades and maintenance over the next 50 years. On July 10, 1930 Chester McCarthy, the Volunteer Fireman with the most service of any fireman in Charles County was voted into the Department. In 1930 the first mutual aid to neighboring areas was initiated with the U.S. Navy Fire Department at Indian Head and the Leonardtown Volunteers in St. Mary’s County. The Town Council of La Plata voted to provide the land and material for the first fire station located behind Mitchell Motor Company at the water town site, heat was provided by a new oil space heater donated by a La Plata businessman. In July 1931 the La Plata Volunteer Fire Department received its first support from the Charles County Government in recognition of the efforts put forth in supplying fire protection to all the citizens of the county. This was a $500.00 appropriation that would grow over the years to the present fire tax. In August 1931 the La Plata Volunteer Fire Department paid all its indebtedness and celebrated with an all day and night party for all members on the Port Tobacco Creek. Fortunately there were no fire calls that day. In September 1931 the members of the Department, using personal funds established a fund. Enabling the Department to aid the poor of the community with food and clothing; establishing a precedent which was followed for many years. At that time the County was lacking many of the Social Services now available to its citizens. In May of 1935 the two La Plata Banks were asked to loan the Department $3,000.00 for the purchase of another engine. After much discussion the Southern Maryland Bank and the County Trust Company each agreed to lend the Department $1,500.00 and a new Chevrolette truck equipped with a Seagrave pump and body was ordered. One needed improvement occurred in May of 1942. Mr. Harry F. Wood was authorized to install a toilet, shower, basin, and a 500 gallon septic tank at the fire house for a total cost of $295.00. Bunk beds were also purchased in 1942 establishing the practice of sleep-in-crews at the fire station. In 1945 after years of work by a committee made of W. Mitch Diggs, Leo K. Farrall, and G. Sellman Garner, the annual appropriation from Charles County was raised from $500.00 to $3,000. In 1946 after the difficult War years, shortages of manpower, equipment, and money the Department started urging the County Commissioners to enact adequate fire codes to protect the citizens. The Town Council was also asked to maintain the town fire hydrants. On June 12, 1947, the La Plata Volunteer Fire Department became a member of the Southern Maryland Volunteer Firemen’s Association. A 500 G.P.M. Mack pumper with a 500 gallon water tank was ordered in October of that year. The Fire Department was to host the Southern Maryland Firemen’s Association Convention in April of 1948. In anticipation of that event new window shades were ordered for the meeting room upstairs at a cost of $14.60. $40.00 was set aside for refreshments for the delegates. During the years of 1949, 1950, and 1951, besides the usual alarms the La Plata Squad was plagued with a number of spectacular and tragic fires that brought the Department’s members almost to total exhaustion. Fortunately, help was on the way with the birth of the Hughesville, Waldorf, and Nanjemoy Fire Departments. La Plata officers and members helped in many ways to organize and train these much needed Fire Departments. The newly formed Nanjemoy Fire Department first responded to a Chimney Fire at the Boswell property in Doncaster which they promptly extinguished before La Plata arrived after a 17 mile run. In November the first regional training for Calvert, St. Mary’s, and Charles Counties sponsored by the University of Maryland was held with out Chief and members in attendance. It was noted that the newly organized Waldorf Volunteer Fire Department sent a delegation for training including President Noel P. Dodson and Chief Walter Delp. At the February 1951 meeting discussion ensued concerning two-way radio communication. Chief Levering was asked to contact the Hughesville and Waldorf Fire Departments and obtain their feelings about a County wide system of Communications. As a result of this discussion two way radio communication was established between the Fifth District, Waldorf, Hughesville, Nanjemoy, and La Plata’s Fire Departments. In February of 1951 it was suggested by John C. Hancock that the President write a letter to all Charles County Fire Departments asking to meet with the La Plata group in order to organize a County Firemen’s Association. As a result of this and a lot of other hard work by all the Volunteer Firemen in Charles County the first County wide Central Fire Alarm Communications in the State of Maryland was established on the second floor of the old La Plata Fire House in 1954. This Communication center, known as “Center” was manned fully around the clock by the Volunteers of Charles County until the Charles County Commissioners took over its operation and moved this facility to the Court House in La Plata. In 1957 the County Commissioners agreed to pay $3,000 towards the operation of this facility, now their cost exceeds $150,000.00 per year with a fully paid center. 1. New Fire House at approximate cost of $50,000. 2. New Fire Engine at approximate cost of $25,000. 3. Annual income of approximately $12,000. 4. About 30 active Volunteer Firemen. 5. Re-organization of the Ladies Auxiliary. 6. Tank Truck of at least 1000 gallon capacity. Within six months plans were being finalized for the new Fire House, $6,000 had been raised through a letter appeal to the citizens of La Plata. We had 35 trained active volunteers, and the Ladies Auxiliary was re-organized and working hard, with an 1800 gallon surplus tank truck in service. In November of 1959 the Town Council committed $10,000 towards the new Fire Station on Charles Street. A Building Committee was appointed consisting of Wally Scott, Martin Matthews, Franklin Winkler, John Matthews, and Edward Saunders, Jr.
in December 1960. The Department also placed in service a new 1960 Brush Truck and the Ladies Auxiliary finished the second floor and kitchen of the new Fire Station in time for the May 7, 1961 Southern Maryland Volunteer Firemen’s Association Convention which was held in La Plata. Dedication of the new fire station occurred at the Southern Maryland Convention much to the delight of La Plata’s proud Volunteers. In November of 1962 the Department accepted delivery of a 750 G.P.M. Mack pumper carrying 500 gallons of water, 1800 of 21/z” hose and all necessary equipment including the first Master stream nozzle capable of flowing 500 G.P.M. in Charles County. In February of 1963 the second floor meeting room of the La Plata Fire House was the scene of a critical confrontation between the County Volunteers and the political power structure of Charles County. After a serious offer by all of the Departments to turn the responsibility of Fire protection over to the County Government, the County Commissioners agreed to support the Volunteers efforts to obtain adequate and fair funding through a County wide fire tax. In December 1963 our Tanker was totally demolished while responding to a house fire in Wicomico, fortunately the two La Plata Volunteers were not killed but did sustain serious injuries, this was a very sobering experience for all the members of the “squad.” The Department decided that they would construct their own tanker incorporating many design features such a a “quickdump valve” the first in Charles County and this apparatus was placed in service at a minimum cost to the Department, But, only after hundreds of Volunteer hours by the Tanker Committee chaired by Edward Sanders, Jr. This committee was so confident that they immediately took on a major renovation and repair job on the 1948 Mack pumper. In June of 1966 the 1930 “Seagrave” pumper responded to its last fire call at Howard Johnson’s Motel and before retiring traveled to the Maryland State Firemen’s Association for its last parade after thirty-six years of faithful service to La Plata and Charles County. On December 8, 1966 new Engine 13 a 1966 Mack 750 G.P.M. pumper carrying 500 gallons of water and all necessary equipment was placed in service. Emergency alarms had risen to over. 400 calls a year and the Department’s budget exceeded $50,000 annually. 1968 spawned the riots in Washington, D.C. requiring La Plata apparatus and Volunteers to spend over 36 hours in service in Prince George’s County. Fire calls now were exceeding 500 calls a year. In February 1969 the members of the Department’s Planning Committee recommended to the Department the purchase of a used aerial ladder truck to improve the Fire Protection for the growing La Plata area. In July 1969 a 1954 American La France 65′ Aerial Ladder Truck was purchased, used, for $19,000 and placed in service as Truck-1. This step, another first for Charles County, initiated another important service to the citizens of La Plata. In December 1969 ten years after the Department barred members under age of 18 from membership, junior members were again admitted to the Department. Twelve junior members started a regimented program in an effort to develop active firemen for the future manpower needs of the Department. Tool “Jaws of Life” which was purchased by the County Commissioners and assigned to the La Plata Department. The Department received a favorable but critical report from the Insurance Services Office of Maryland, the agency that sets the insurance rates for various jurisdictions in Maryland. The Department appointed a planning committee to work with the Mayor and Council of La Plata to maintain or improve the Town’s insurance rating. As a result the Call Firemen Program was initiated by the Mayor and Council to improve the manpower available to the Department. Town Fire Codes were reviewed and initiated increased inspections to improve the general fire safety for town residents. To insure that the Town had an adequate water supply the aquisition of the “Tilghman Lake” and new well and Storage facilities were developed. Plans for the third Engine Company for the Department were also made as a result of the Insurance Services Recommendations. This engine was delivered in October 1974. A 1974 all wheel drive 750 G.P.M. pumper carrying 500 gallons of water and all necessary equipment. The first alarm it responded to was one of La Plata’s most spectacular, Edelen Brothers Tobacco Warehouse fire. The La Plata Volunteers and machines with the help of other County Volunteers prevented a conflagation, successfully protecting all exposed buildings by applying over 2200 gallons of water per minute to the fire. The training and pre-planning had again saved the day in La Plata. As a result of the recommendation by the Planning Committee the Department started discussion and efforts to either relocate or enlarge the Fire House. After pursuing various avenues the Department proceeded with enlarging and remodeling, resulting in a most beautiful and modern fire station which will meet La Plata’s needs for many years to come. In March of this year yet another major advancement was attained. The 1967 Company built tanker was replaced by a 1979 Mack Tanker equipped with a 1000 G.P.M. pump and 1600 gallons of water. This apparatus is equipped with the latest equipment which will enable the Volunteers to better serve and protect the La Plata area. The 1000 gallon per minute pump increases the overall capacity of the Department meeting the Insurance Services Recommendations to insure the lowest insurance rates possible for the property owners in La Plata. control of small fires and tasks unnoticed by the public, results in far greater savings in human misery and property loss. As the soldier, in time of war, looks to the home front for supplies so too the firemen depend upon his supporters for the appliances needed in his work. Without raising the money needed, managing the affairs of the Department, and maintaining the apparatus and equipment nothing would be possible. Stay tuned for the next 25 years of the Department’s history that is being put together as we live day to day.